In the world of music, specifically Classical Music today, there are no iron-clad rules as to what style is in favor, what is au courant. It is OK to be Atonal or Tonal, Neo-Anything, High Modernist or rethinking Early Music forms, anything goes. 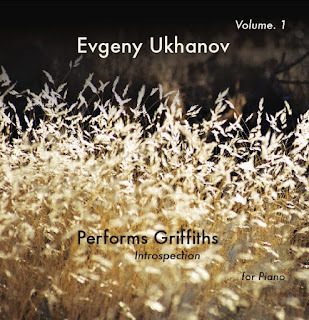 So Alan Griffiths gives us Neo-Romantic piano in the manner of Chopin, Liszt or Rachmaninoff, only in his own original light, on Evgeny Ukhanov Performs Griffiths, Volume 1, Introspection (GriffithsComposer). There is an hour or so of piano music here, from the very lyrical "Reverie II" to the cascading tides of "Rhapsody & Fantasia," the melodic and feelingful "3 Meditations" and on from there. There is substantial music to be heard. "A Touch of Tango" has just that but thematically and notefully it is much more than one might expect and there lies what is special about this music and its fine performance by Evgeny Ukhanov. It is backward looking, even past dwelling, but it does that in ways that transcend mere rear-view mirror gazing, for it has authentic originality. Very beautiful piano music, beautifully performed. If lyrical Neo- makes sense to you, I do recommend you dive into this one. If you have slogged with delight through a great deal of Wagner, been piqued and satiated with Mahler's Symphonies and Song Cycles, sat by the speakers and/or sat in concert halls for long whiles while Richard Strauss wove for you his tone poem narratives, and bathed thoroughly in the musical-natural seas of Debussy, perhaps then you might explore the orchestral music of Austrian composer Joseph Marx (1882-1964). Most specifically is today's reference point and the only one I have experience thus far. We have his inaugural volume on the ever-exploratory Naxos label, Orchestral Works 1 (Naxos 8.573831). I came to this program with no previous exposure to his music. According to the liners he was "one of the leading figures of Austrian musical culture during his lifetime." And, as we readily hear and the liners attest, his music was rather old fashioned, not at all a part of the Modernist world, the revolution in style that both Austria and the Classical Planet experienced increasingly beginning in his younger years and rather completely by his death. The liners also tell us that at that point his presence on concert programs and recordings all but vanished. Until now. We get a chance to evaluate his music today, thanks to this series. I see the second volume has come out as I write these lines. All I can talk about though of course is what I am hearing on Volume 1. We are given the chance to examine and consider a three-work Natur-Trilogie he wrote in 1922 and 1925. The dates place it all squarely in a time when of course Strauss and Debussy were alive, productive and considered quite important to the times, though of course Schoenberg, Hindemith and a number of others were actively moving beyond such things. And the above in the end is of no matter other than as a situating factor, an historical context. Each work in the Trilogy is lengthy in itself, lasting from 15 to 25 minutes. The three tone-poems interlock thematically as addressing the world of nature, which the overall title makes clear. The first work is a "Symphonic Night Music," the second, a "Concertino on the Pastoral Fourth," and the third is titled "Spring Music." All three have a rhapsodic gush that makes them less Impressionistic and more Romantic than is typical of Debussy, say. The music seems to straddle both worlds, the strings often swelling Romantically while the winds and horns are more the pictorially Impressionistic as a rule. As a product of Marx in his 40s we can assume they are the mature works of a composer already well on the way to realizing a lifework. I cannot say after many listens that Marx clearly delineates himself with some extraordinary originality. Yet he is quite a craftsman, that I do hear. I am not sufficiently stirred by this music to seek out further volumes, though I am happy to hear this one. If you specialize in the Austrian scene and want to flesh it out he is an important listen. I am not entirely sure that this is essential to the rest of us. It is well performed and well written. But it is not going to change your musical world, I suspect. If you like the idea of an Impressionistic Strauss, then you might find this worthwhile. Otherwise you may not find it awe inspiring. But if you can preview it, go ahead. You might love it. I do not. I like it though. Cold Blue Records is a central place to explore the world beyond Minimalism. Radical Tonality is the niche where much of the music on this adventuresome label resides. Yet even then if you do not know Michael Byron's music you may not be prepared for what you will hear on his new release for the label, Fabric for String Noise (Cold Blue CB 0054). 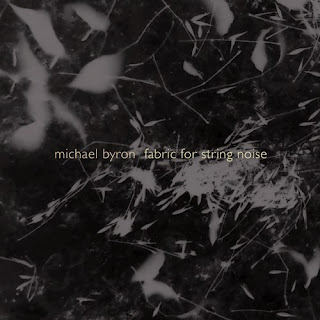 Two Byron works comprise the EP at hand, "Music for String Noise" in two parts and "Dragon Rite." Both make use of the studio to layer the sound. What might surprise you if you do not know his compositional way is heard very readily in the title piece "Fabric for String Noise." The entity String Noise is the twin violins of Conrad Harris and Pauline Kim-Harris. Byron calls for them to build up a musical menagerie of twittering conferences of aviatory violins via pentatonic-diatonic double stops and rapid figurations around several shifting tone motifs. The result is a soulful trip into a heaven-sent cacaphony of multiple voices that have the immediacy of some of the Free Improv flights that achieved levitation, such as Coltrane's classic "Ascension" or some of Alan Silva's wonderful large group works. It is a journey into the Radical Tonality world in the way it stays with a serial set of motives as the springboard for the sound sculpting. It is a most delightful trip! "Dragon Rite" takes an opposite tact in that it is build out of the low register bowed sustains of James Bergman's double bass. Where "Fabric" is high registered, Dionysian, mercurial and ever moving, "Dragon" is a block of low pitched, Apollonian stasis, slowly deep. It is music that takes you into a special world and has its vision, then is gone. Michael Byron has a special way about him musically. Try this one and see where it takes you. It is a happy listen if you open to it like I did. If you might not think you are the person who would wake up in the morning and exclaim, "It is time to listen to Bohemia-born Johann Ladislaus Dussek (1760-1812)!" perhaps you underestimate yourself? "He's no Beethoven!" one old lady said to the other as we were exiting the concert hall after hearing Colin Davis beautifully perform some Elgar. No Beethoven also is Dussek. Though as a pianist and composer he was at the top of fame during his lifetime. Of course he was more in Papa Haydn's realm age- and period-wise, a Classicist with at the end a nascent Romanticism. And if he did not climb Mt. Olympus easily to occupy a central spot in the Immortal Pantheon, neither is he without merit as a craftsman of the highest rank. As I contemplate the noteful and peppy Classicism of Dussek's Complete Piano Sonatas Volume Four (Brilliant 85604), as played ably by Tuija Hakkila on a period pianoforte that sounds a bit more forte than some of the vintage instruments but then charmingly untempered the slightest bit, too. 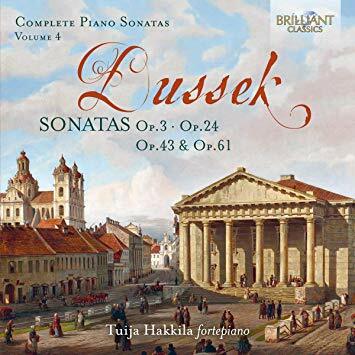 It cannot say that these particular Dussek sonatas played so well by this particular pianist on this particular instrument is the absolute ideal to me at the moment. To be honest there are times when these old pianos sound a little like sewing machines even though Hakkila gives it all a heroic effort. Perhaps it is the heroism of the music-performance tandem that makes the piano seems less up to the task than a modern instrument? I know this might be heresy but not every combination with a period piano is ideal. The pensiveness of Chopin is a great thing for the old sawbones. Not as much bravura dash such as Dussek gives us in the earlier works here. Yet I must say that the music itself and the performances do have much to recommend them. We hear quite clearly how well wrought the music is, more perhaps (as I remarked the other day with a Boismortier disk) in terms of an everyday brilliance and not the "heavens-are-opening" paradise of a Moonlight Sonata or Art of the Fugue. As so like one should not always drink 20-year-old-Scotch, it is probably healthy to spice up our listening with really great yet "average" "folk" music of any period. This way we can plum the most scenic vistas of "sea level" possibilities in between the soaring to the most distant stars of the most sublime music ever? So I feel quite refreshed by this Dussek, even by the almost flawed yet very characteristic period sound of the piano. It feels like it is 1800 and we are in some drawing room being treated to some lovely sounds as we hear the Sonatas Op. 5 No. 3, the Op. 24, Op. 43 and Op. 61. The Brilliant price is an incentive to spring for this volume. Whether you'd want the complete Dussek is a matter you'd decide after living with this one for a time. Surely it is no mistake to let yourself be beguiled by these works so dynamically performed. You will understand what Dussek can do, certainly. And he could and can do a lot for us. Even today. I was having a conversation with a friend of mine the other day and the topic of Boismortier came up (which tells you of course that this friend is very much into music). If the level of invention is often somewhat stronger in a Couperin and a Bach, why pay Boismortier any mind? My friend made me think about this and a little while later I have this answer to start today's blog. Because Boismortier is so handily a composer of his time that you feel a part of everyday life in the Baroque when you hear a fine performance of his music. The invention is very characteristic and rather than being transported out of the time to some timeless realm of the Musical Gods, you are in effect eavesdropping on a musical event from the vantage of hundreds of years in the future. So Boismortier puts you into a time machine, while Bach opens the gates of paradise? Something like that. And so all this is possible for me today listening to a nicely turned program of his Music for Flute, Viola da Gamba and B.C. (Brilliant 95754). On it we are treated to the Umbra Lucis Ensemble performing some eight works for varying ensembles. There are three groups of "Pieces de clavecin," a "Trio Sonata" for recorder, viola da gamba and basso continuo, works for one or more recorders and b.c. or just harpsichord, and a Suite for viola da gamba and b.c. 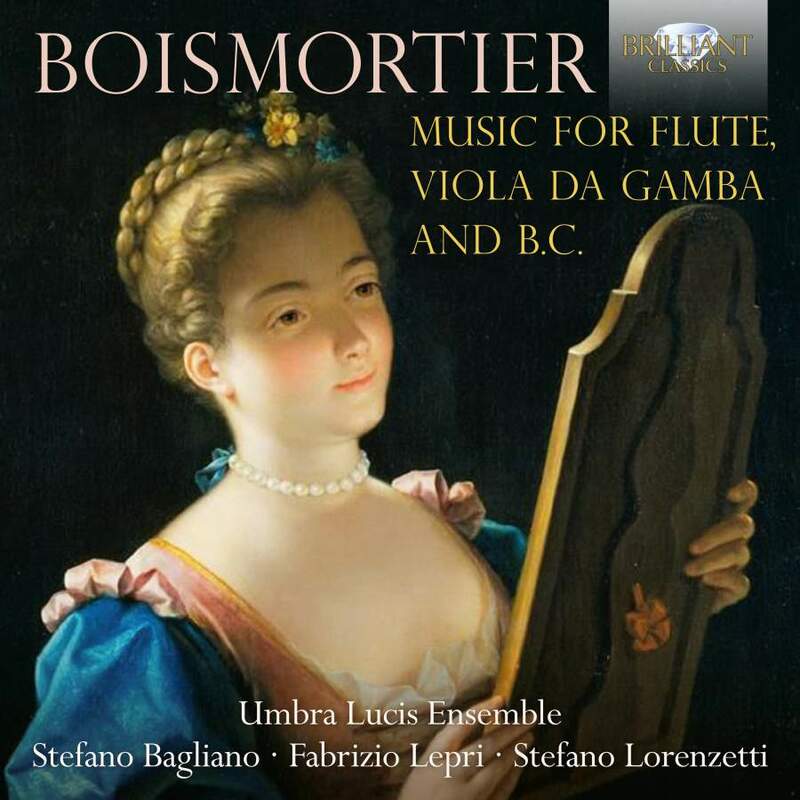 The continually shifting ensembles that varyingly feature in authoritative fashion the principals of Stefano Bagliano on recorder, Fabrizio Lepri on viola da gamba and Stefano Lorenzetti on harpsichord continually freshen the ear with the novelty of ensemble grouping. The principals are further supplemented in the course of the program with two additional recorders when called for and a second viola da gamba player to form a part of the basso continuo as needed on the da gamba and b.c. suite. The players seem in every way true-to-form with their approach to the original instruments and instrumentation. The resonance of the viola da gamba both within the basso continuo and as a solo voice is a remarkable thing when done properly as it surely is done here. The entire program is ravishingly characteristic. But then recorder(s) and harpsichord made an unmistakable period impression on your listening mind as well. If you might not wake in the middle of the night humming Boismortier, you also will not feel like he was just virtually, musically twiddling his thumbs to create piles and quantities of music for the sake of it. He was careful and eloquent in these works, so there you go! For the Brilliant price it is something of a Godsend for all who love the French Baroque like me, or the viola da gamba, harpsichord, and/or recorder or who are not sure and would like to hear more of it all. If you are feeling cocky and you think you know all the composers, guess again. There is a never ending stream of composers old and new being performed and often enough released in recorded form these days. And good for that, certainly. What about Heinrich Baermann (1784-1847) and Carl Baermann (1810-1885)? Their music I have been experiencing on a new Brilliant Records release, covering their Music for Clarinet and Piano (Brilliant 95785). So what of them? The liner notes spell it out. The father and son should be considered "among the the greatest clarinet players of all time." Their compositions reflect an attention to the burgeoning voice of the instrument in late Classical-early Romantic times. They were widely admired in their day, and in many ways gave Europe (and eventually the world) the foundational inspiration for the clarinet virtuosity that we now take for granted. The selection of compositions by Heinrich and Carl contained in this program are mostly first recordings. 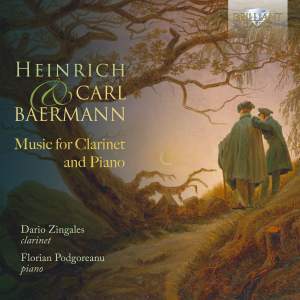 Dario Zingales realizes the clarinet parts with a beautiful ringing tone and agility. Florion Podoreanu aquits himself quite nicely as an able and effective partner on the piano. The first thing on the first listen that one will recognize is Carl's clarinet-piano transcriptions of 6 Lieder of Schubert's. You will recognize many or most of them and it is quite nice to hear them as realized for the clarinet. The music as a whole has the kind of lyrical clarity and soaring qualities of clarinet parts you may have heard in works by Schubert and Weber, Mozart and in time Brahms. It is not an accident since the influence was undoubtedly a two-way affair as the time and place allowed. There are moments as well of pronounced clarinet virtuosity, understandably. The six additional, original works are a boon to anyone who loves the clarinet and seeks to trace the origins of the modern style. The music is in no way tangential or ephemeral. And it all gives pleasure in the well executed performances we are given by Zingales and Podgoreanu. This is a bargain as a Brilliant release and if you are a clarinet enthusiast, you are sure to respond to it all. The recent Boston Modern Orchestra Project release The Witch of Endor (BMOP Sound 1062) exemplifies how and why the Project is such an important thing for Modernism in the USA past and present. It is a three-work mini-retrospective of the orchestra music of William Schuman (1910-1992), who might be somewhat in eclipse since his passing now some time ago, yet as we hear quite readily on this album, deserves to be appreciated and does not show the mark of time in his music so much as he seems more current than ever, to my ears at least. I won't rehearse his biography in depth, but as a president of Julliard from 1945 to 1961, then of Lincoln Center from then to 1969, that he was New York born and bred, that he went to NYU like I did, in all that it was pretty inevitable that I came upon his music early enough and that he seemed naturally affinitive to me over the years. My first brush with his music must have been around 1970? So that was almost a half-century ago. If you were in and around NYC then and you kept your ears open, his music was there to be discovered. And in that there is nothing remarkable in and of itself at this point in our musico-historical consciousness. He was something of an institution when alive. When no longer here his music must speak to us in itself or none of it matters. And what is so reaffirming in the release at hand is that the three works chosen by BMOP for this release remind us of Schuman's brilliance as a composer, as an orchestrator, as a very inventive and original voice for the Modern scene in the USA of his time. And, as I have come to expect from BMOP, the performances are in every way state-of-the-art, detailed and filled with an understanding sympathy. It is interesting to hear these three works in this sequence because it affirms that Schuman was doing music in the vanguard of the times as early as 1947, in "Night Journey" and 1949, with "Judith, Choreographic Poem." Both works are at the edge of tonality. They occupy a niche not of course so much Pointillistic and Serialist, that was emerging in Europe then, but deliberately flowing, somewhat darkly pastel, alternately at rest and moving forward. It may have more in common with the "serious" side of Copland, with the American Symphonists of early-to-mid 20th century and perhaps Hindemith, all that more than with Webern and Boulez or for that matter Varese. It was a different lineage but nonetheless an important one still. The involvement of this music and dance is dealt with admirably in the liners and you should read them if you are interested. 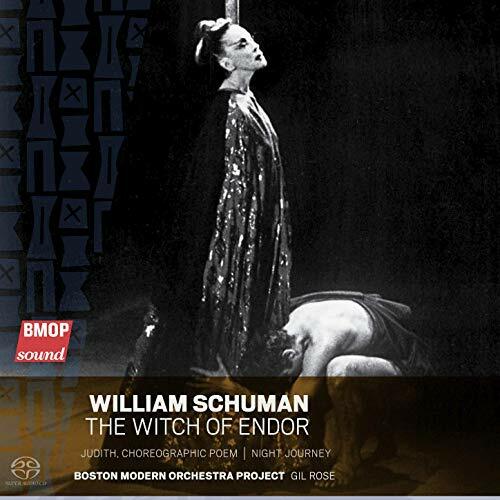 "The Witch of Endor" (1965) puts the capstone on the music with a very powerful and evocative orchestral meditation both brooding and Promethean in turn. It is masterful tone painting of a high order and reminds us palpably what poetic brilliance he evinced, what a vivid musical imagination he possessed. 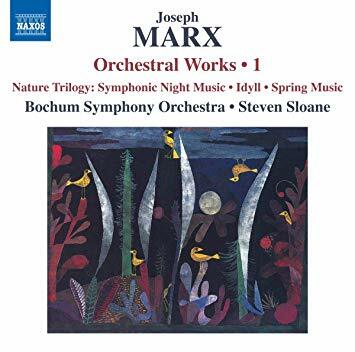 It is a testament to the landmark service BMOP is rendering, to flesh out keenly and artistically the legacy US orchestral composers have given and are giving to the Modernist project. This volume along with an earlier volume of the music of Foss (index him for that review) are particularly outstanding. This one is a beautifully realized program of some very key Schuman. Molto bravo! Do not miss it. In a way both Baroque and Classical era music are like the Blues. Virtually everything written in the Classical style zone takes a certain general form, yet the difference between composers, once you hear it, are central to an appreciation of the period. So of course there is Bach, Handel and all the rest! Or Haydn, Mozart and all those rest! Or there is Bessie Smith, B.B King and all the rest! 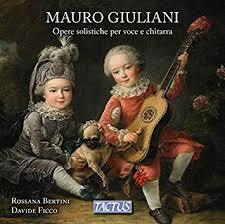 And then there is Mauro Giulliani (1781-1829), nothing to do with the Blues of course, ornately expressed yet too late in style and period to be exactly Baroque, but so the crisp intensive form of things can be experienced in the hearing of his music today. And the intensiveness of his guitar writing is a grounding in the fundamentals of the Classical Guitar style, yet captivating and special in its own way..
Let's bracket the relation of this music and the Blues for now, for what matters is a nice album I have been enjoying, the music of Giuliani entitled Opere solistiche per voce e chitarra (Works for voice and guitar) (Tactus TC 780703), featuring the excellently ravishing voice of Rossana Bertini and the remarkable guitar of Davide Ficco. The music itself is most tuneful and vibrant in the Italianate matter. There is a bit of coloratura brava and a ringing singability that Rossana Bertini handles with the soul of a poet and artist that she is. And the guitar parts are quite idiomatic in the best ways; they give Davide Ficco plenty of opportunity to show his considerably accomplished and expressive way with the guitar. It is an album that keeps making me smile on winter days like this, or for that matter virtually any days! It is a delightful and unexpected treasure that those who appreciate a well-turned and well played-sung phrase among voices and guitars will find fits the bill quite happily. Recommended! 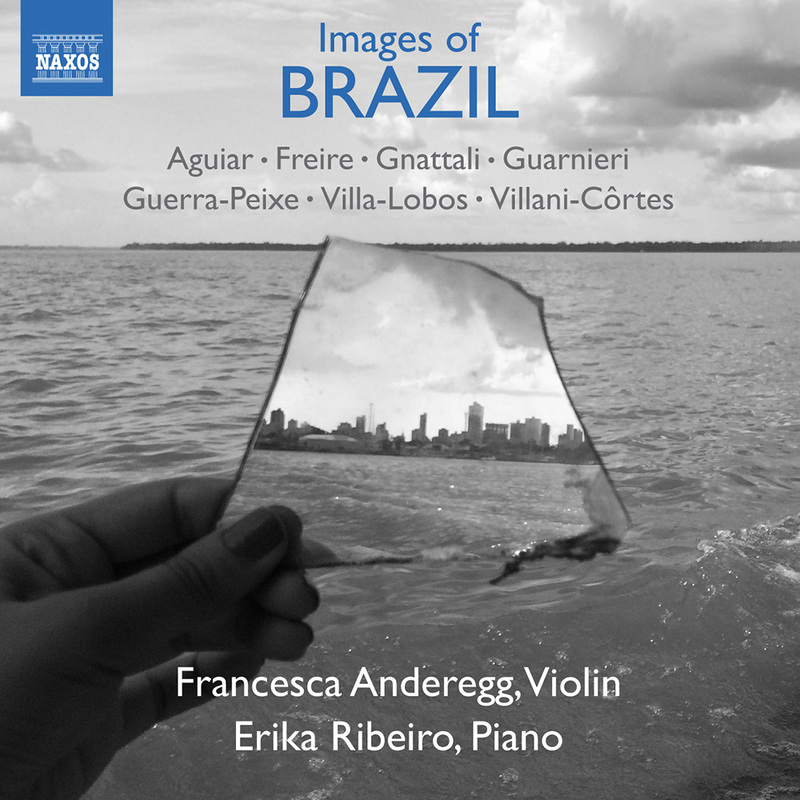 Images of Brazil, Francesca Anderegg & Erika Ribeiro Play Villa-Lobos, Guarnieri, Freire, etc. The music of Brazil is a vast possibility of riches that we outside of its borders have often not nearly enough familiarity with. The Naxos label has given us a good selection of Villa-Lobos works nicely sequenced and performed, and will be embarking on a 100-work exploration of other Brazilian composers, the first volume of which I expect in the mail shortly. 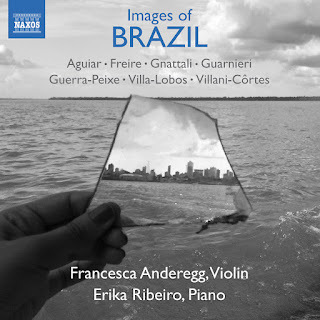 In the meanwhile we have this fascinating anthology of Brazilian music for violin and piano, played with flair and charm by violinist Francesca Anderegg and pianist Erika Ribeiro. It is as you can tell by the above an album called Images of Brazil (Naxos 8.573923). On it we are treated to seven works by seven composer, some perhaps not very familiar to most of us, the music all between 4 and 17 minutes in length. When generalization cannot quite get specific enough on a Monday morning we still need to encapsulate, so let me say that all these works share in the melodic-harmonic light of the Brazilian legacy, which is to say that there is Modern tang and Neo-Romantic expression, what one might call "Brazilian Impressionism" and a lyricism that has something of the saudade of Brazilian musical sense to much of it if you know how that feels. And that as a whole is what makes Brazilian and Portuguese music Romantic in different ways than European Romanticism, at least part of the time. In all of this there is something of that in there to be found, surely. So a not-so-familiar Villa-Lobos ("The Martyrdom of Insects") has a good feel to it, and some of us will recognize Mozart Camargo Guarnieri (1907-1993), at least by name. His "Violin Sonata No.4" is seriously played with a passion that it justly evokes and lots of content thematically. From there we experience a huge helping of the unfamiliar but in the end the absorbing and timely. We have Cesar Guerra-Peixe, Les Freire, Ernani Aguliar, Edmundo Villant-Cortes and Radames Guattali. Of all of these three are among the living (Aguiar, Freire and Villant-Cortes). The rest have in common that they left this earth somewhere between 1988 and 1993--except Villa-Lobos, who died in 1959. So these are contemporaneous composers more or less of the recent past or the present. None of this music is in a High Modern zone so much as it is Melodic Modern Mainstream I suppose you could say. Yet too there is music of depth and concentration to be heard throughout. Nothing is meant to ingratiate so much as to experience in full. And if we open ourselves we get music excellently performed and lacking nothing. It is a tribute to the fullness of this musical experience to note that on the sixth listen I am hearing more, and still more, so that has to be a good thing. Those not content to settle in with the same names and the same categories will find this a bracing run through lesser-known music. It is not inferior, no, just not what we generally know. So now we can. Know. That's good! Recommended. Congrats to Anderegg and Ribeiro for a beautiful performance! And thanks to the composers, too, of course. 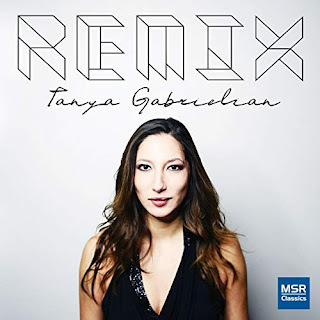 Pianist Tanya Gabrielian shows herself a poetess of the ivories as we get a chance to hear her in REMIX// Bach Transcriptions (MSR Classics MS1594). Any Bach enthusiast who might also enjoy an exuberantly pianistic reading of some fairly exotic transcriptions of Bach classics will gravitate towards this very enjoyable program. We get transcriptions by various people of things one might not at first blush think of in piano-centric terms, like the "Chaconne from Partita No. 2 for Violin," the "Violin Sonata No. 2 in A minor BWV 1005," and the "Cello Suite No. 2 in D minor." It is like getting an unexpected gift out of season, for the transcriptions reveal aspects of each work we might not have heard quite like this before. It is a joy! 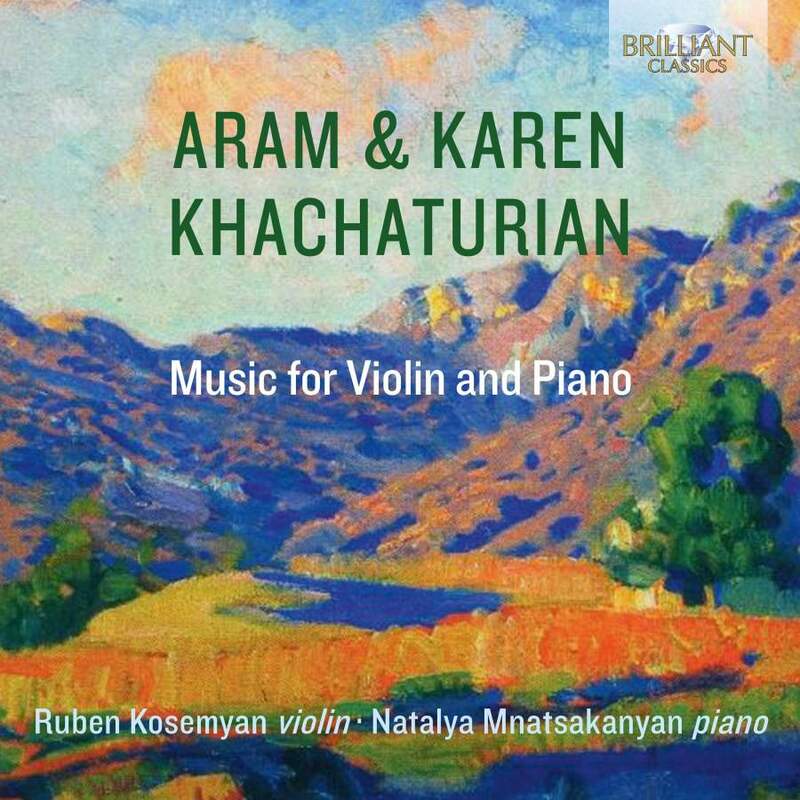 Aram Khachaturian (1903-1987) was in his music a poignant blend of the Armenian roots of his heritage and the Modern Russian milieu he encompassed in his own way. His nephew Karen (1920-2011) may be less familiar to some of us (me, for example) but is recognized as a worthy composer in his own right. Both get representation in the recent release of their Music for Violin and Piano (Brilliant 95357). We get to hear Karen's 15-minute "Violin Sonata in G minor Op. 1" (1947). It has an Armenian melodic quality; it has a rhapsodic air about it with memorable themes and a kind of earthy yet expressive way that make it quite worthwhile to hear. The rest of the album is Aram in situations both quite familiar and then less so, but ever characteristic in his gift for crafting music one does not forget easily. His most well-known work, the "Sabre Dance" from his ballet "Gayne" appears here in its Heifetz transcription for violin and piano. 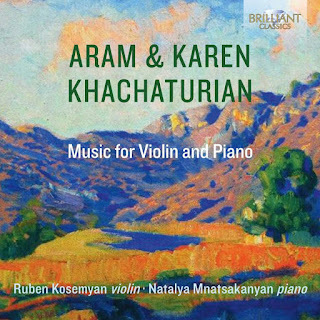 It loses none of the excitement of the original and has a different sort of intimacy in the duo version that Kosemyan and Mnatsakanyan capture readily and fully. The same can be said for the beautiful "Andante Sostenuto" transcribed from the "Violin Concerto," haunting music that benefits from an alternate hearing in chamber terms. It is nice to check out the less familiar pieces on here as well, a "Dance," the "Lullaby" and "Ayesha's Dance," the latter two from the ballet "Gayne." Good to hear also are the "Song-Poem" in Honor of Ashugs and the "Adagio" from the ballet "Spartacus," both in duo arrangements here that seem perfectly suited to the character of the music. A key to the success of the program is the sensitive and artistic sensibilities of violinist Ruben Kosemyan and pianist Natalya Mnatsakanyan. They are in their element with this music and obviously relish the playing of it. Add to that the very low price of this Brilliant release and you have a very worthy disk that could serve as an excellent introduction to both composers or a welcome supplement if you already know their music. Recommended. 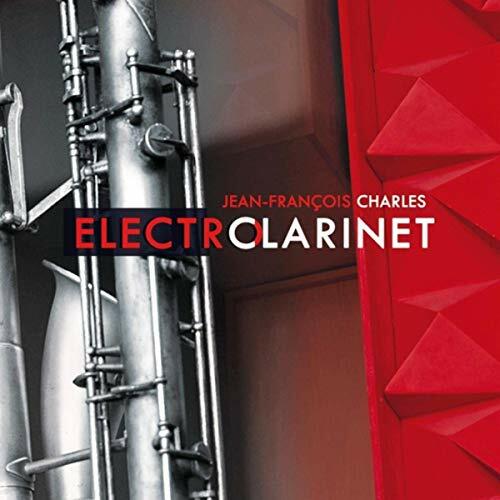 From Iowa City we have Jean-Francois Charles and his adventurous album ElectroClarinet (self released). On it we have some seven studies for Bb clarinet, A clarinet, bass clarinet, Eb clarinet or contrabass clarinet and live electronics. The music has a spontaneity yet a logical sequencing that puts it all certainly in New Music territory yet also has some of the immediacy of Free Improvisation. A fully extended vibrancy of articulation and full-throated clarinet technique nicely play off against the furthering and effectively nuanced electronics Maestro Charles employs. Digital delay and layering, timbral extensions of harmonics, sound colors, etc are made full use of--quite happily. At times the clarinet becomes an orchestra of its own and at no time does the interface of acoustics and electronics seem in the least bit gratuitous or mechanical-perfunctory. True woodwind facility conjoins with a very lively musical imagination for a program that fascinates and makes for a most absorbing listen throughout. This album may at first blush seem unassuming. But after a few listens it increasingly stands out as an excellent example of its kind. Very heartily recommended! There is much to be said for mixing it up, for a change in pace, for something from another time and place. I tried to watch the Grammys the other night and could not last very long. No offense to the artists honored but the current state of Pop may have a return of good vocalists yet sometimes I have a tough time with the instrumental parts. Alicia Keys' Hazel Scott tribute was nice enough, though. Still, changes of pace are not coming from Pop right now, not for me. Among the many other musics I appreciate and explore regularly, on the classical front a change in period can refresh me greatly. 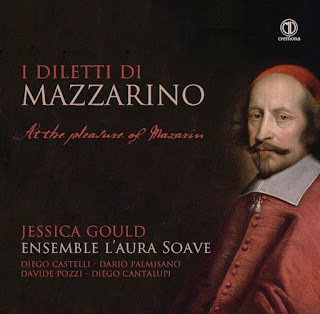 Like for example there is this Modern-day performance example of original instrument chamber music with vocalist, works from the Italian Baroque, on the recent I Diletti di Mazzarino (At the Pleasure of Mazzarin) (Cremona 018/44). It is a nice gathering of a few choice instrumental miniatures along with vocal numbers featuring the very robust soprano Jessica Gould and a beautifully period Ensemble L'Aura Soave. They tackle works by the likes of Luigi Rossi, Virgilio Mazzocchi, Giacomo Carissimi, Francesco Cavalli, and Giovanni Battista Lulli (the French spelled his name Lully). Not every composer will be familiar to those who are not specialists in the period and place, but the music is quite fetching. Jessica Gould has a great deal of energy, enthusiasm and verve. You might even say that she "belts" this music out. The ensemble is a sweet one. They and Ms. Gould take us swiftly and readily to another time and place. A few listens and I was very well disposed to this program. I like the rough and tumble local edge to it all and the timbre of the music reminds us that there was a special sound to it that has much to offer us. Perhaps this might not be your first choice if you know nothing of the period. But for those who already have their ears attuned, this is a nice addition. With 250-300 of these reviews a year in the classical fold my head sometimes feels like it is spinning with all the unfamiliar voices and works I happily explore. I must refocus and concentrate and so here I go again with that.Today it is the Slovak composer Alexander Moyzes (1906-1984). He is new to me. I have playing in my space the album at hand, Symphonies Nos. 7 and 8 (Naxos 8.573653). According to the jacket blurb Moyzes brings to us the most well known, most acclaimed it would imply Slovak symphony cycle in Modern times. And clearly from the standpoint of my ears the 7th and 8th Symphonies are quite in the thick of it. Both are reactions to Moyzes experience of tragic happenings, the 7th in memory of his young daughter, taken from him far too soon, and the 8th a response to the Soviet invasion of Czechoslovakia in 1968. Some 14 years separate the two symphonies--the 7th coming in 1954-55, the 8th in 1968-69. The liners talk of a similarity to Shostakovitch in the 8th. In its brash cry of anguish, perhaps yes. And in the rhythmic passages of motor insistence, absolutely. All in all however what impresses me is Moyzes' own original tone-painting brightness. The liner blurb also mentions his two-fold expression of both Slovak strains and Modern orchestral trends in his compositional outlook. Again, I cannot say I disagree with that from my ear-take on the two works offered on this program. And yet again, he has certainly gone his own way on these symphonies at least. There are vividly descriptive passages, narratives in motif building and development. and in the 8th and parts of the 7th a long unwinding at times of musical pathways that sound like event-amental incidents getting retold in musical terms without being literally programmatic. Then too the liners inform us that Moyzes studied at the Prague Conservatory and then in a master class program with Viteslav Novak (someone whose music I have just discovered as well), who gave him a mandate to pay attention to the Slovak heritage and in that way set him forward toward folkish expressions which we hear so poignantly expressed in the 7th. Moyzes' 7th lays out a Slovak landscape of the countryside, the evocation of nature and peasant gatherings, dances and the like. It is not as a stark sadness that we hear Moyzes in this outing. The opening pastorale movement is a sort of Slovak response to Beethoven's 6th, really, but beautifully and originally so. The scherzo continues the rustic mood in most charming ways. Then the largo brings in a gentle sadness, a loss that seems as wistful as it is regretful, and then bursts out in time into a woeful mourning. It is extraordinary music. There is a bittersweet quality a times that reminds me of Prokofiev without directly evoking him, and perhaps even a bit of the epic Mahler depictions? The finale is energetic and dance-like, and not without a parallel of loss and nonetheless a pastoral mood alongside the whole of it. All that by way of a hint of what is being "said" in the music. It is the work of someone who knows what he wants to say and says it beautifully, personally well, very well. It is a rather extraordinarily likable symphony, to my mind. The 8th, as alluded to above, has a more heightened Modern angst about it in keeping with the upheavals and heartbreaks of the Prague Spring. It is a stunning work as well yet a rather different kettle of fish than the 7th. I will leave it to you to listen and appreciate, which I certainly recommend you do. This is music that is symphonic in the best of dramatically depictive ways. Like Smetana's Moldau each movement is a chapter in a story that has dramatic unification. 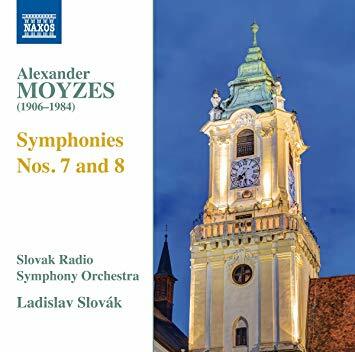 Moyzes is less literal than Smetana perhaps and more "Modern" at times, surely. There would be no mistaking on close examination these symphonies for something from the 19th century. Yet the Slovak elements are more timeless than contemporary too. So there you have it. I come away from listening to this volume with the wish to hear the earlier three volumes of the cycle and I look forward to to the next volume due out shortly. Moyzes has something of his own to offer us. Anyone who looks to Eastern European 20th Century developments might well want to explore this recording--the price is right and the performances are first-rate. Highly recommended. During his long life span (1908-2012) US composer Elliot Carter established himself as a major voice in New Music, one of the brightest lights of the later 20th century. Once he found his own very original niche he refined and honed his music to thrilling levels of complexity and High Modern expression. The String Quartets are as fine as anyone's from the Modern period but then there is an additional wealth of music in chamber and orchestral realms that we need to absorb and appreciate. Today it is time to consider a program of some of his final works, written between 2003 and the year of his death, 2012. 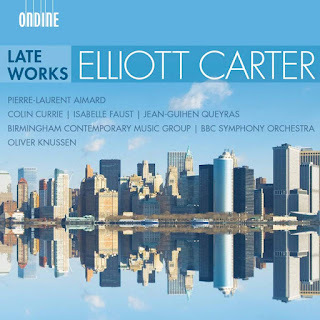 There are a good number of recorded premiers to be had on this CD and in any event all the works are well performed by the Birmingham Contemporary Music Group and the BBC Symphony under Oliver Knussen, plus Pierre-Laurent Almard on piano, Colin Currie on percussion, Isabelle Faust on violin and Jean-Guihen Queyras on cello. The album is aptly titled Late Works (Ondine 1296-2). On a Monday morning this seems a fitting description and alerts us as to what we will hear. The final decade shows Carter much in the same vein he had been in for some time, a kind of post-Darmstadt expanded atonality, a remarkably worked over musical geometry of great detail and exploratory zeal, a music very aware of each instrument's idiomatic qualities and a vision of how they can be amassed and apportioned. The complex rhythms had been developed to an advanced point where the absolute precision required of each player results in a timeless quality that bubbles and boils forward to an ultra-architectonic uber-chaos of exactitude? Something like that. It is sublime music indeed. Like fractals the great complexity of the whole may at first blush seem chaotic, yet underneath there is form subtly co-existing with an exploded. expanded music world. Perhaps it is interesting to contrast this kind of complexity with the Cagean one--there the composer allows chaos to enter his front door, so to speak, yet in the end we hear order and structure after all if we listen closely, repeatedly, intelligently. We hear in all some seven works. In order of year of completion there is in sum the 2003 "Dialogues" for piano and chamber orchestra, the 2005 "Soundings" for orchestra, the 2007 "Interventions" for piano and orchestra, the 2010 "Dialogues II" for piano and chamber orchestra, the 2011 "Two Controversies and a Conversation" for piano, percussion and chamber orchestra, the 2012 "Instances" for chamber orchestra, and the 2012 "Epigrams" for piano trio. It is a great deal of unfamiliar music and it does require close listens and perhaps several hearings for a full appreciation. That said however, there is no mistaking this music for something merely, generically "avant" so to speak. It is the profound set of final musical utterances by a master after more than 85 years of composing! Anyone wishing to be exposed to High Modern masterpieces from the very decade we are currently within (give or take) should not hesitate about this one. Carter was undoubtedly among the greatest of the last really brilliant Serial/Post-Serial composers of our time. I suspect his music will be heard and loved by music appreciators for many centuries hence. 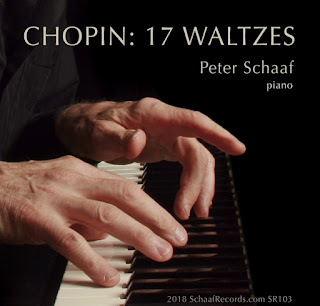 Chopin wrote 17 Waltzes (Schaaf Records 103). Peter Schaaf performs them with an honest candor and a partisan's zeal on a recent album of the same name. It continues the waltz mood he established so convincingly on his previous 44 Waltzes (type that in the search box, above left, to read my review). Chopin wrote and published eight of the waltzes during his lifetime; nine more were unpublished at his death out of which five were assigned opus numbers; four more were never "opused." I do not need to tell you of the virtues of Chopin's piano works. The Waltzes are vibrantly melodic and sensitively evocative. Chopin opened up a realm of piano expression that was as extraordinary as it was innovative, and too so naturally singing forth. This is marvelous music and Peter Schaaf disarms us with an extraordinarily unpretentious reading of it all. You feel care and spontaneity in equal measure . Some of this music is of course as familiar as any piano music can be for those who have lived in the present-day musical culture for any length of time (e.g. with the "Minute Waltz"). So to make it all seem fresh is a challenge for any artist today who would wish to play them. Peter succeeds because he enters into the mood of each as if it were HIS mood, and so in fact it becomes so in his hands. So if you do not know this music or if you do and would like to put a fresh reading in front of your ears, this one is a good thing, a very good thing! Recommended. To find out more about Peter Schaaf and his music and to order go to schaafrecords.com. In the course of following my classical music muse, I have found there are certain composers I tend to welcome consistently into my hearing zone like a familiar friend who is up to something new (though perhaps not having lived on this earth for quite some time, even centuries by now). Others I might be happy to hear more of, but do not always know what exactly I might come to think of it all as a whole. Then there are those for whom I can always be convinced about, but for now I have not made up my mind. And finally of course the unknown artists I am just discovering. Paul Hindemith (1895-1963) belongs in my mind to the first category. He was principally a viola player as a musical artist (though he played other instruments well, too). So we might expect what he wrote for the viola was potentially something special, something he well might play in public himself. That is certainly true of the four works that appear on the CD at hand today, on the album Complete Sonatas for Viola Solo (Brilliant 95413). We hear all four solo viola works played with dedication and I might say nearly self-effacing devotion by Luca Ranieri. 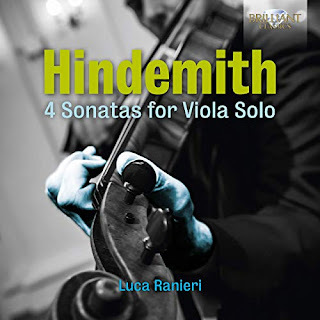 Hindemith turned to solo string works I would assert as one of those who had in mind how singular were the Bach works for solo violin and solo cello. Do not forget that Bach's unaccompanied works were entering the concert repertoire during Hindemith's lifetime, after years of being relegated to what the string players viewed as pedagogical studies of great value but not seriously considered "concert music." That all changed in the last century Fellow composers Max Reger and Bela Bartok, to name a few of his roughly contemporary colleagues, also devoted some attention to the unaccompanied world of solo stringed instruments. Both wrote notable examples still being performed today. For Hindemith this sort of "Extreme Chamber" milieu was an important realm that to him expressed something timeless yet too something very Classical-Modern. On this CD we linger awhile with all four works, the "Sonata Op. 31, No. 4," the "Sonata 1937," the "Sonata Op. 11 No. 5," and the "Sonata Op. 25 No. 1." All are of course "serious" fare in ways that marked Hindemith as much or more than any contemporary composer of his time. This was viola music for the classical sake of it, ever expressive in a somewhat stoic and even slightly severe manner. There was a very powerful thrust forward, with an aim not to realize beauty per se but, as Nielsen asserted for his own music, to gain a kind of characteristic note-upon-and-after-note eloquence. Hindemith composed with a certain rigor no less central than those who in earlier times applied their own visions of note weaving in contrapuntal practice. In the later '60s and early '70s when I first started listening to Hindemith there was a rigidly defined stylistic set of camps that existed between those that might favor Hindemith and those that were enthusiastic partisans of Webern and those that followed in his direct wake, the Serialist Dodecaphonic folks typified by the Darmstadt School. From the retrospective illumination of the present, when you listen to these rather fully abstract works you hear of course that Hindemith was constructive of his musical sequences in a more seminally tonal-structural world than Darmstadt yet his music and the Darmstadt High Modernists both favored an absolute musical-abstract stance that the experience of was and is not as far apart as one then imagined in the heyday of such controversies. In that way the largest, most general aesthetic aims of the Neo-Classicists and the High Modernists did in important ways converge. In contrast one might assert that these camps (in their earlier stages anyway) seemingly diverged more sharply than not from the Cage-and-followers US contingent. When I say above that Luca Ranieri is nearly self-effacing in his performance of these works, I do not mean to suggest that his playing is not ultra-schooled and precise, very musically profound even. I only mean that his devotion to making the music sound as it was intended does not result in the sort of overtly performative showmanship one might possibly find in solo string realizations that call attention to the interpretive mannerisms of the artist. There is none of that to speak of here, yet in the end it is a pretty brilliant reading we experience of the music. And in the end we are able to immerse ourselves in every turn of phrase on this program. We get the full Hindemith prescription undiluted and exactingly spelled out. With the very low Brilliant retail price we can have this music for a song. I very much recommend that you spring for this one. It is Hindemith the way he saw himself, undoubtedly. And that is a very good thing! The contemporary world of New Music keeps on. Nothing stays the same because music is a living thing and we humans interject ourselves into the mix at all points. If robots composed and performed the music, it is possible things would eventually enter a steady-state of absolute stasis, but since we are all slightly different every day and different people come onto the scene every year we can look forward to new things always. And so today I have an example of a newness that is upon us and good for it, certainly. 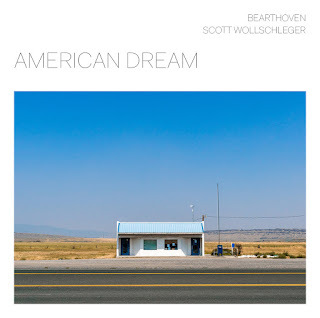 I speak of the chamber trio Bearthoven, the composer Scott Wollschleger, and their album American Dream (Cantaloupe 21146). 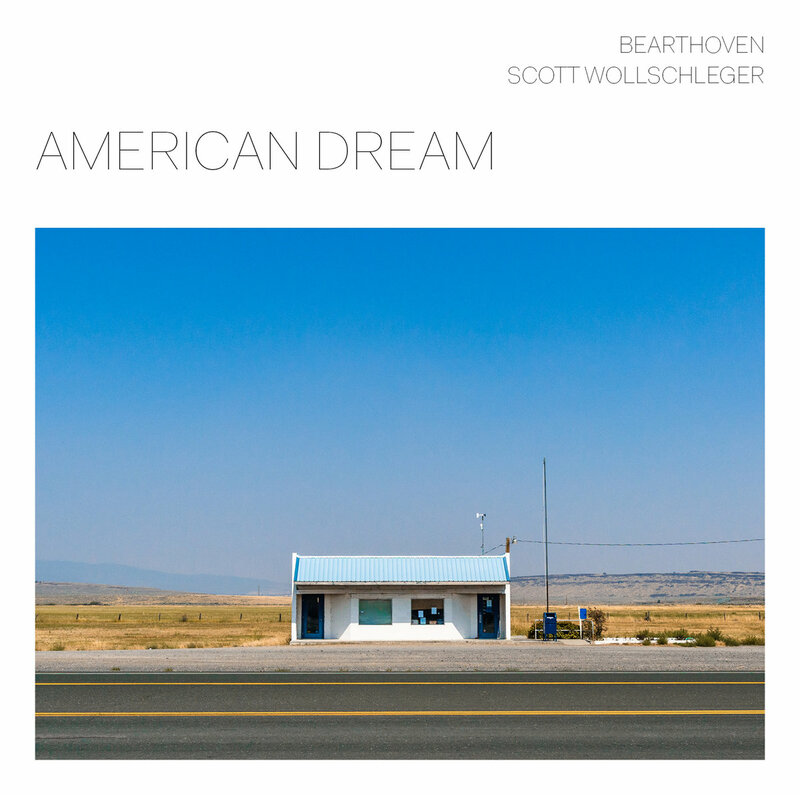 The group consists of Karl Larson on piano Pat Svoboda on double bass and Matt Evans on percussion and vibraphone. The music is appropriately dream-stoked, a closely knit alternatingly single (Karl alone) double (Karl and Matt) and triple-tiered interaction (Karl, Matt, Pat). The compositions call for a rather wonderful interplay of the instrumental voices in syncopated, complex coordination at a level rarely encountered. The music is oft times in a sort of Minimalist zone that nods overtly or otherwise to what later Morton Feldman was doing and also at times the music of Mayuzumi. By that I mean that the patterns repeat and are constructed of something different from the interlocking lines of a Riley or a Reich. Lines are constructed more pointillistically or more specifically in a rapid hocket-wise fashion. And the way the patterns lay out are at times like a Persian Rug--the musical cells sequenced but too separated and contrasted in ways more like a sprawling rug design than a babbling brook. There is not a trance feeling so much as a sort of open mystery of different pattern-objects passing by our ears like an ethereal parade. Now all that is not simply that Wollschleger is some clone of things. Not at all. He contributes a great deal to the pattern op-art that has been put our way in years past. It is a furtherance, not a rehash. And at the performance level the Bearthoven trio is extraordinarily focused on the Zen of the interactions so that magic is in the air always. The music is a happy outcome, something very much Modern in one of the new ways that can be so today. I must say I love what is happening here and I recommend it very much. The path leads us out of thickets and we take it with some relief! And lots of pleasure. Anton Dvorak was in my youth one of the first of the composers I found myself listening to. My inaugural listens were of "From the New World," then a little later the Cello Concerto in a budget release I found, a live recording with no less than Rostropovich in the solo role. I lived happily with that version for very many years, and then because of a life disruption my vinyl had partly to go and now it is gone. I find often enough that if you have become used to a particular version over a long period of time all versions heard subsequently refer back to that version. And so that is not always so bad a thing. I recently had a chance to hear and review another version and I am glad I said "yes" to the opportunity. It is a new release of cellist Kate Dillingham doing Dvorak's Cello Concerto and Other Works (Affetto 1806). The Dvorak I most love is a kind of a folk music classicist. That of course is obvious in his New World but there is it seems to me often enough a kind of homespun Bohemian folk naivety in his melodies. The singing quality of the melodic content of the Cello Concerto is to me a good example of how Dvorak shapes melodic subject matter in his own way. consistent with the rootedness in the music of the land that surrounded him. Ms. Dillingham chooses for the "other works" on this program two pieces for cello and orchestra that bring out that singing melodic trait in the composer. The "Silent Woods for Cello and Orchestra" Op. 68/5 and his "Rondo in G minor" Op 94 fit very much in this happy place. 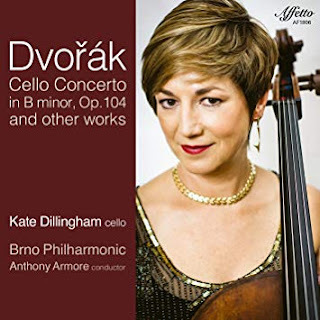 And so too the way Kate Dillingham, the Brno Philharmonic and conductor Anthony Armore approach the Concerto is very much in a kind of homespun way. Tempos are relaxed, there is no hurry and no one seems bent on creating a spectacular impression of great Promethean superhumanity (as of course a Rostropovich was after in thrilling ways) so much it is as if they are walking leisurely down a rustic path in the Bohemian forest, in no hurry to get to a destination, lingering now here, now there and savoring every bar of music, as it were. This is a Dvorak that is not so much after-Beethoven (though everyone was at that point in some ways) as a with-himself. The concerto and the rustic preamble pieces hang together in ways that clearly come out of a deep understanding and love for the music itself. Ms. Dillingham in many ways makes her cello sing beautifully more than exclaim dramatically. And that seems after a few listens how I would like to hear the concerto right now. So kudos! Bravo for this Brown Study of a reading. On remiX (Deutschlandfunk Coviello Contemporary 91728) composer Christoph Maria Wagner takes the Pop-HipHop-Dance Music idea of the remix and applies in to a compositional view of things. In other words the remix practice of taking the original content of a recording and re-arranging and/or reemphasizing the original elements is applied directly to written musical content. So we experience a re-situating of Beethoven on the "remiX-Suite fur Klavier," of German folksongs on "remiX IV," Scriabin on "remiX V."
The "Suite for Klavier" makes use of the idea of layering and bifurcation to assemble a complex multi-stranded pianism, to re-present some familiar Beethoven (the first theme from his Fifth). The results are a massive "making new," a de-sequencing and re-situating of the musical elements in complex ways. 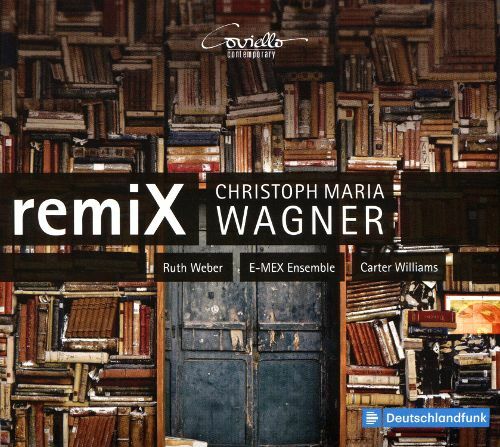 "remiX IV" makes excellent use of the large chamber ensemble E-MEX and soprano Ruth Weber in the re-presentation of eleven German folk songs. I find this work especially invigorating. It is no mean feat to create a kind of High Modernism expanse out of on the surface of things rather earthy fare, from what one might think of as contra-Modern fare. That Wagner succeeds in creating an "other" is a tribute, surely, to his vision and musical acumen. And it is first-rate Contemporary music at that. The other principal piece on the program in the "remiX V" combines piano (the composer), live electronics (Carter Williams) and pre-recorded loops to deconstruct and reconstruct some Scriabin source material. All told this CD program gives us a deeply complex and expansive universe of very Modern sounds that allow us to open to an alternate perspective of what it is to do New Music today. I recommend this one surely for anyone interested in the advanced nether realms of the very contemporary right now. What I do not know about Romuald Twardowski (b. 1930) could fill many volumes. Until the release at hand, in fact, I knew nothing at all of him. Yet with this music in my head after several listens I must say I am very glad to know of him now. We have at hand a worthy program of works he composed between 1979 and 2006, concerted works for violin and orchestra, all save one, which is for string orchestra alone. Central to the presentation is the 2006 Violin Concerto (Naxos 8.579031). The whole of it is beautifully given to us with violinist Kinga Augustyn holding forth as needed with a sturdy yet impassioned robustness that always seems just right for the tenor of this music. Mariusz Smolij conducts the Torun Symphony Orchestra with a sure hand and a complete conception of how the music should sound. The orchestra responds nicely. The music is not all that Modern with a capital /m/, yet it is not stuck in any kind of automatic replay of the past either. He puts forth a music of genuine integrity and original conviction. It is perhaps more Neo-Classic than Neo-Romantic. There is a definite lyrical side that we hear throughout, yet nothing is sentimental so much as singing and ringing forth. The "Violin Concerto" is the linchpin work as far as providing a soaringly singular voice for the solo violin that Augustyn responds to with angelic charm. 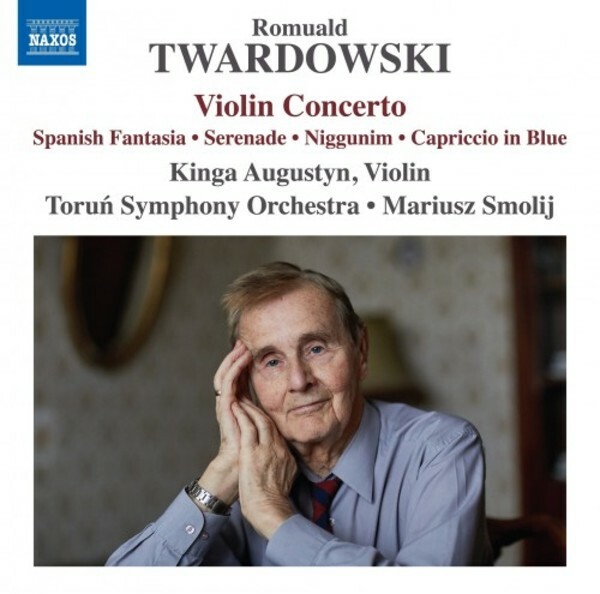 All the concerted pieces serve to extend Twardowski's vision of the violin's role today in such things. Score and performance nicely conjoin in happy confluence. Each work has a pronounced flavor, definite character, from the rhapsodous plainspokenness and then impish sprightliness of the "Violin Concerto" to the pronouncedly Jewish melodiousness of the "Niggunim 'Melodies of the Hasidim,'" the Gershwinian tang and tinge of "Capriccio in Blue," the lively and convivial Spanish tinge of the "Spanish Fantasia," it is all good. Then the string-orchestra-only "Serenade" gives us a more direct hearing of his pronounced ease over the falling of the melodic contours on the natural string-ly idiom, his capriciousness as it were. And there is a kind of gritty torque Smolij gets from the strings on "Serenade" that we then listen for all the more readily in the other works. And we then hear it all the more readily. If you are a lover of strings you will appreciate what is done with them by Twardowski and the performers here. This is the student of Nadia Boulanger, another one who came away with a deft sense of possibilities, whose Lithuanian heritage comes through in his music without necessarily calling attention to itself. The music has Modernity without necessarily following the typical models of how that might come into play and harmonic-melodic strains are not so edgy as they are folk-like in some fundamental sense. There is a natural brilliance to his idea of what sorts of things the block of orchestral strings and the solo violin can do. It all works wonderfully well and after a good number of listens I hear the full musical personality of this heretofore unknown composer and it seems like a very good thing. If you have the mental-aural space to add more music to your living experience this volume is a very pleasant surprise and well worth your time. And a big bravo to violinist Kinga Augustyn!